Action scenes can be tricky to get right. As an editor, I spend a fair bit of time nitpicking over my authors’ fight scenes, action sequences, and general choreography. They scramble chronology, conveying information about a sequence of events out of the normal order we’d receive that information. Example: “Wham! He hit the floor as Bran’s fist connected with his jaw.” What’s wrong here? I’m getting the sound effect, then the consequence of the blow, and only after that being told that the blow was struck. Although it’s fast enough that the information all gets to me pretty close in time, there is still a split second of uncertainty when I read “Wham! He hit the floor” while I don’t know what’s going on. During that split second, I am spending time thinking about what I missed, which breaks my immersion and has the effect of slowing down my reading. In a longer, more elaborate version, I might be spending two or three sentences wondering what just happened. That would kill the momentum of that action. They are too internal, explaining thoughts and rational consequences, and providing far too detailed reactions, which slow the action down to a standstill. Example: “He hit the floor. What was all that about? Why had Bran hit him? Was it over his insult earlier that day? He’d get payback, that’s for sure. Before Bran could follow in with a boot he rolled to the side and leapt to his feet. Now he was ready. He swung at Bran.” What’s wrong here? 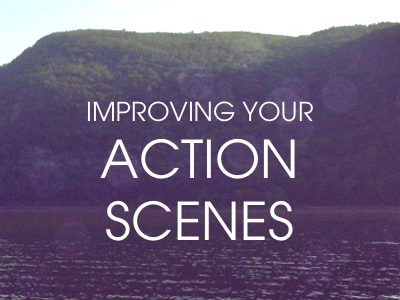 If you’re after a quick action scene, all this thinking stops us dead. We don’t have time to cover all those thoughts in the chaos of fists being thrown. OK, you could argue that the human brain does range far and wide in very quick, urgent bursts, including within a fight. When the author translates those small bursts of thoughts into words, and the reader has to receive those words and then translate them into images and concepts in their own mind, a lot of time is lost. They lack emotional impact, sacrificing any sense of urgency, tension or reaction, in order to cover simply the action. I often see authors describing a punch being thrown without showing me the recoil from the recipient, and the pain or other emotion it creates. Conversely, they may dwell far too much on the recoil and not set the reader up well for the importance of that action. I suspect that when people struggle with their action writing, it’s because when they think of memorable action scenes the one bit they remember is the payoff/result/reaction, not the setup/action, so they forget exactly how important the setup was in that scene. They remember the body hitting the canvas, not the punch being thrown. They remember the bullets hitting the body, not the trigger being pulled. Because they know what’s just about to happen in their own action scene, and how important that death/injury is, they obsess about getting that consequence onto the page first, and end up neglecting the build-up. make sure the characters feel something about the fight. That’s it. That’s the entirety of the fight. And even though I read it 25 years ago, I still think about it today. Why does it work so well for me? Well, at this stage in the novel we know that Connor, our protagonist, is a retired LAPD officer who has spent years in Japan and is an adept martial artist. In the immediate build-up to this fight, Jeff, an arrogant doorman, has bragged about his black belt, attempted to bully and intimidate Connor, and has poked him aggressively in the chest. We are already rooting for Connor and know that Jeff needs putting in his place. That gives us all the preparation we need before the fight scene happens. It’s the setup that packs the punch. The actual fight is one sentence and it has all the impact of any larger battle scene. Action/reaction continuity issues tend to crop up a lot in first drafts, which I would say is not necessarily a writing problem, just a phenomenon of first drafts, and in my experience writers can usually self-edit this once they’re aware they are doing it.